Texas Instruments Concept III distributed by Zayre Corp. Size: 5.8" x 3.2" x 1.3"
Zayre Corporation was founded in 1956 by Stanley and Sumner Feldberg in Hyannis, Massachusetts as a discount department store chain. Zayre launched already in August 1975 the CONCEPT series of portable electronic calculators with the introduction of their first CONCEPT 24. 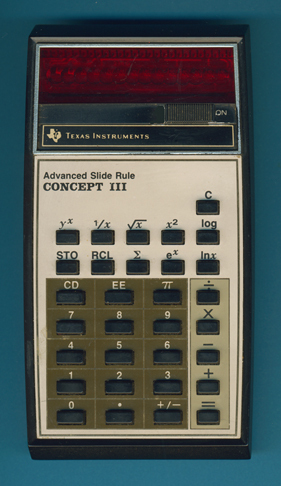 The Zayre CONCEPT Calculator Series culminated in June 1976 with the introduction of the Texas Instruments CONCEPT I, CONCEPT II, and CONCEPT III calculators based on the TI-1200, TI-1250, resp. SR-16 II but disappeared already in August 1979 with the clearance sales of the CONCEPT COMPACT calculators. Following the path of the Slide Rule (SR) calculators like the wonderful SR-16, the CONCEPT III was called Advanced Slide Rule. If you explore the calculator deeper, you'll immediately catch the similarities to the SR-16 II. The only differences are the coloring schema of the faceplate and the size of the letters. The slightly oversized keyboard printing was continued later with the TI-1255. Even the inside view and a deeper look on the backside of the calculator gives us no additional differences to a common SR-16 II. The printed circuit board (PCB) is identical to a SR-16 II. Both the SR-16-II and this rare CONCEPT III calculator are based on a TMS1016 single-chip calculator circuit, a member of the famous TMS1000 Microcomputer family developed already in 1974. The backside of Kirk Muri's calculator revealed a small surprise: A serial number with three leading zeroes! Let us assume that production numbers kept well beyond the marketing expectations. Fellow collectors - if you own a Zayre CONCEPT calculator, please report us the serial number and date code from the back of the calculator for our Database.